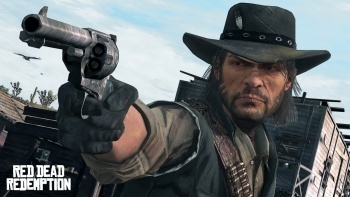 An Irish news site has taken exception to the inclusion of Irish stereotypes in Red Dead Redemption. Rockstar Games has come under fire for the drunken character "Irish" in Red Dead Redemption. Herald.ie, an online newspaper based in Dublin, took offense at the character, saying: "The stereotype of the drunken Paddy will again be taken advantage of, as the game's town drunk is called 'Irish'," adding that the character "sours the launch" for gamers with Irish heritage. This isn't the first time that Rockstar has upset ethnic groups with its games. Most notable was the "Kill the Haitians" mission in Grand Theft Auto: Vice City, which resulted in Rockstar releasing a new version of the game with certain lines of dialogue removed after Cuban and Haitian groups complained. Could "Irish" be removed from future versions of the game? There's certainly a precedent for it.